2 Department of Physics, Bayero University, Kano, Nigeria. Simultaneous measurements of air temperature were carried out using automatic weather stations at 14 tropical locations in Nigeria. Diurnal variations were derived from the 5-minute update cycle initial data for the years ranging between 2007 and 2013. The temperature trends in Nigeria revealed a continuous variability that is seasonally dependent within any particular year considered. The analysis was carried out using available data from the network and the results are presented with a focus to characterize the temperature variations at different locations in the country using the mean, maximum and minimum temperatures from the north which is arid in nature to the south, which is a tropical monsoon climate type and a coastal region. 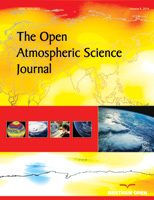 In overall, temperature variations in Nigeria were observed to have higher values in the far north, attributed to the influence of Sahara Desert, which has less cloud cover and therefore is more transparent to solar irradiance and lowers values in the south, where there are more cloud cover and abundant vegetation. Measured maximum and minimum temperatures in Nigeria are respectively 43.1°C at Yola (north-east part of Nigeria) and 10.2°C for Jos (north-central part of Nigeria). The least temperature variations were recorded for stations in the southern part of the country, while the largest variations were recorded in the north-central region of the country. Keywords: Temperature, Measurement, Variation, Maximum, Minimum, Mean. © 2017 Okoh et al.